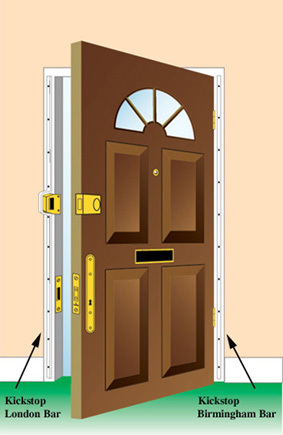 The Kickstop London Bar is a door frame reinforcing bar with a 'D' shaped staple to fit over and secure the staple (keep) of a surface fitted rim lock or cylinder nightlatch. This very effective steel anti-burglary device is screwed on to the internal face of the lock side of the frame and will resist the kicking, splitting and forcing open of the door. At 5mm thick with a rounded edge and countersunk holes, it could blend in with the colour of the frame and is available in a choice of length, width and staple size. Before ordering, please very carefully check the staple size that you require to fit over the door's rim lock staple. If in any doubt, please feel free to obtain advice from us by telephone. Universal - up to 97 x 30mm. Standard - 70 x 30mm. Large - 97 x 30mm. Ingersoll - for handed Ingersoll SC71. Enlarged illustration of London Bar - click below.